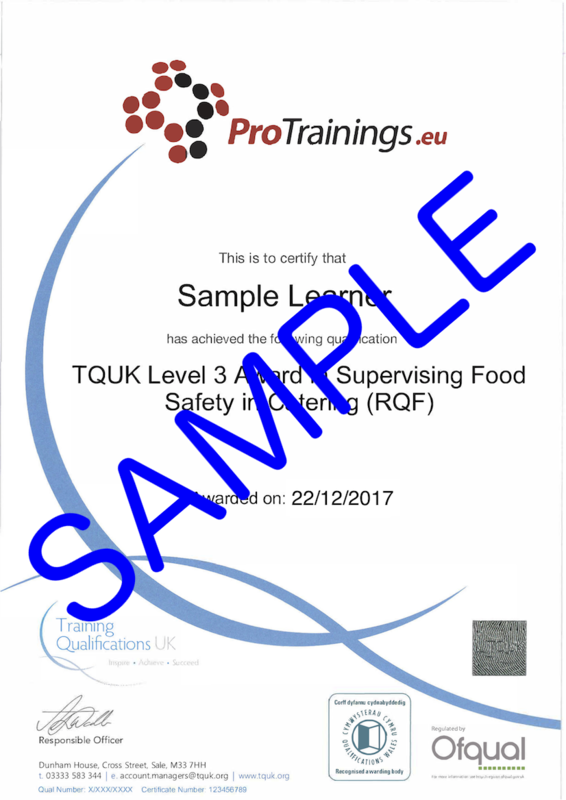 This Ofqual approved qualification has been developed specifically for insertion onto the Qualifications and Credit Framework with full support from People 1st, the Sector Skills Council for Hospitality, Leisure, Travel and Tourism. It is therefore fully compliant with industry and regulatory standards as well as being recognised by environmental health practitioners, auditors and other enforcement officers. This course is a classroom course over two days with a day of pre-study before the course. You will be sent a study book prior to the course which must be completed. This course comes with 25.0 hours of CPD, although the time to complete the course online may be less than this. 1.1 Summarise the importance of food safety management procedures. 1.2 Explain the responsibilities of employers and employees in respect of food safety legislation and procedures for compliance. 1.3 Outline how the legislation is enforced. 2.1 Explain the importance of, and methods for, temperature control. 2.2 Explain procedures to control contamination and cross-contamination. 2.3 Justify the importance of high standards of personal hygiene. 2.5 Outline requirements relating to the design of food premises and equipment. 2.6 Describe the importance of, and methods for, pest control. 3.1 Describe the importance of food safety of microbial, chemical, physical and allergenic hazards. 3.2 Describe methods and procedures for controlling food safety to include critical control points, critical limits and corrective actions. 3.3 Explain the requirements for monitoring and recording food safety procedures. 3.4 Describe methods for, and the importance of, evaluating food safety controls and procedures. 4.1 Explain the requirements for induction and on-going training of staff. 4.2 Explain the importance of effective communication of food safety procedures.